We joined the parade for Akabane Bakamatsuri (festival) under a blue sky in spring. 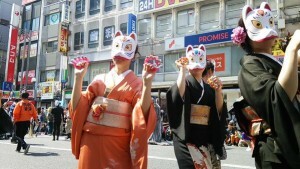 The event held every year in Akabane, Tokyo. There is a live performance, dance show, hero show and free market. The main tourist attraction is the parade. 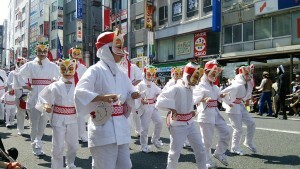 This parade consisted of a student, a member of society club, musical band, dancer and people in costume. 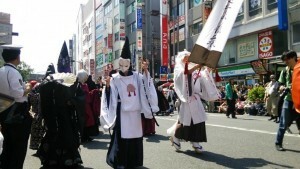 Thousands of people with portable shrines and floats paraded through the city. 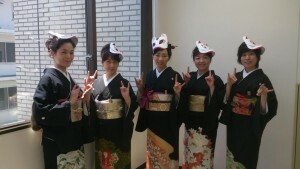 We took part in the ‘Kitsune no nigiwai (fox gathering)’. We had 69 foxes in all. We found a fox bride in other team. It looks completely fox’s wedding in fairy tales. What a wonderful photo this is! 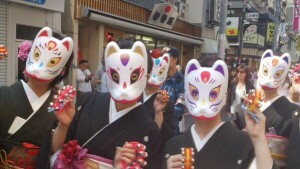 Amazing fancy dress of ‘Kawagoe kitsuneshu’!! They invited us to this event. It was great opportunity for us. Thank you so much! 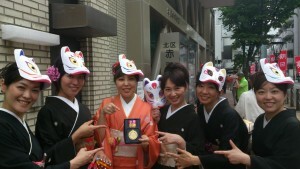 One of our members (Anzu) got a prize during the parade. Thank you very much! The festival and parade attracts 400,000 visitors. It has long history and is loved by the local people. We are happy to contribute our humble efforts to the prosperity of a town and shopping street through events or parades.